Covenant Relationships: Financial Freedom Is Not A Myth! Financial Freedom Is Not A Myth! Have you ever wondered how it is possible that some people have so little, yet seem to have enough; perhaps that is not a good example of financial freedom for many of us, as we envisage financial freedom to be millions of dollars, pounds or even your local currency in the bank. As much as we tend to see ourselves as financially free only when we have enough, it is important to bear in mind that we first need to have enough to be free. Money is a big deal; although many of us say we want world peace, I think we say that because we have enough financially. Why is that many of us have more month at the end of our money (our income is exhausted way before we are due for our next pay check), yet so many people that do not earn as much as we do and have more financial responsibilities make it work? This is finance class 101; take notes! Firstly, avoid being a financial faker! So many of us are in competition with our peers as well as with ghost images of society's expectations of us. I use the word society here as a representation of friends that expect us to go on expensive outings, family members that expect us to have certain things in our homes to match up and of course our colleagues that constantly make us feel inadequate when it comes to 'unnecessary' financial commitments. It is OK to tell someone you cannot afford something; what they think of you afterwards is their problem, not yours! 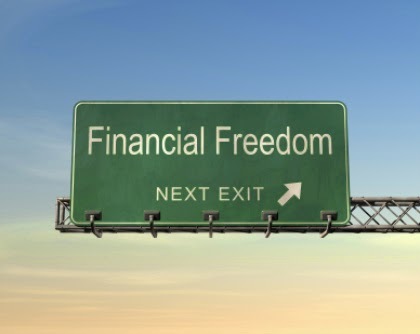 Don't let anyone impose financial commitments that eat into your income on you, simply because you want to save face. If you can't pay cash for it without feeling there will be a big hole in your account, don't buy it! Seriously, don't! I don't subscribe to the idea of buying things on credit and paying every month. In South Africa, people are fond of something called lay-byes where they pay a certain amount every month for a pair of shoes, bags or whatever it is, for a total period of three months. The only thing you should consider a monthly payment for is a house! Things like shoes, bags, clothes, furniture etc... should be bought cash! And to pay cash, you must be absolutely sure you can afford it. If it will negatively impact your feeding budget, don't go there! If you don't need it, don't buy it! This may sound cliche but the ability to differentiate between your needs and your wants will make a very difference in how far your money goes. Fight the urge to go on an impulsive spending spree when you know you are on a shoe string budget. If it is not something that contributes directly to your well-being (good food, good accommodation, electricity, water), then you don't need it. I do encourage people to have a list of their wants and try to allow themselves enjoy one want once a month. One! Until you can afford anything you want at any time. If your want is a pair of shoes for 20 dollars, then factor it into your budget for that month. Be prudent; it doesn't mean you're frugal, it means you're being honest with where you are now. Pay the important bills first! I don't understand people that go buy shoes or shirts when rent is unpaid and due the following week. Settle your bills first!!! Stop misplacing your priorities financially You accommodation must be paid, your electricity and water bills, and there must be food at home before you start to consider anything else. Be wise! Your fancy unnecessarily expensive wrist watch won't put a roof over your head when push comes to shove. Start paying your tithes and saving! It sounds impossible to save because people assume we must be saving large amounts of money to feel like we are achieving something. It doesn't have to be a large amount of money at first but it should be consistent. Strive to save at least 10% of your earnings. Also, as Christians, we must pay our tithes! It is not to widen the waist of the church pastor but it is a command from God that comes with a blessing attached to it (Malachi 3:8-12). Never grumble about having to pay tithes. God is the best business partner you can have; He only asks for 10% and lets you keep 90%! I really think that's the secret to keeping your money- do I need a designer purse or will a normal 'nameless' purse serve the same purpose? Dating Down is a Crime!!! Are You Heading to Tarshish? Silence the Jonah in You!!! Learn to Embrace Who You Are Not! Are You Stuck and Stagnant?